Vital King is made from Korean Red Ginseng. Its finest tonic formula designed to invigorate the body, strengthen one's constitution, and especially, to improve the circulatory system, fortifying against the cause of all diseases. It is more effective than traditional tonic prescriptions. 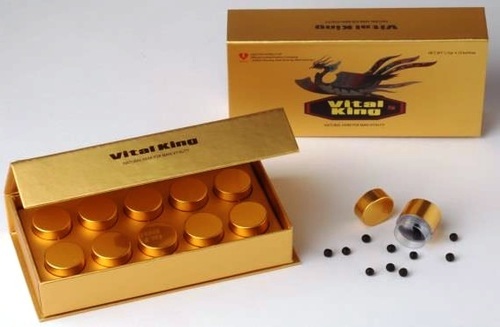 Vital King is made from carefully selected finest quality ingredients: garlic, ganoderma lucidum , pepper, watermelon. Using modern technology to extract and condense each component, it is brewed using the most ideal composition that leaves no burden on the liver, allowing long term consumption as a stamina boosting health supplement. Vital King is made from all natural ingredients that has no harmful side-effects. Vital King has no side effects thanks to its 100% natural herb origin and the way it is being produced with no chemicals whatsoever! Vital King, a 100% natural herbal product, combines ancient recipes and knowledge to strengthen the men’s potency not for one time or day, but for 2-3 days. Coming from the old ages of Korean history and ancient traditions Power Khan is a natural remedy for Your erection, libido and prostate - truly a Herbal Viagra. You will feel a significant improvement in your physical and sexual health by indulging your body with this product as never seen or felt before! Garlic, Ganoderma Lucidum, Ginseng, Watermelon, Black Pepper. Effects last 1~3 days, may drink 1 bottle at any time. (Effects show 1~7 hours after consumption.) (Recommended use): First two days drink a bottle a day. Afterwards, its nutrition will accumulate inside the body and you may take one bottle every 2 to 3 days. When to start taking Vital King? Power Khan can be taken at any age - this is an amazing 100% natural herbal enhancer - For Young And Old. Even if you do not experience any symptoms listed below Vital King is very beneficial for Your general well being and overall strength and not just as a treatment of erectile dysfunction.